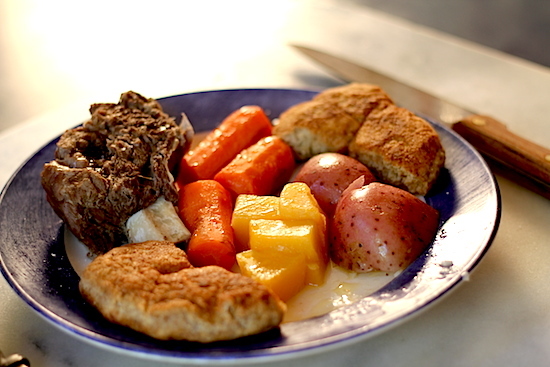 Art’s a master at making this traditional boiled dinner of beef ribs with rustic-style root veggies – a “quintessentially Cree way of eating”. Veggie broth and bouillon are modern shortcuts simplifying this cozy comfort dish that nourishes the body almost as much as the soul. Substitute moose ribs if you have some on hand! • Mix dry and wet ingredients separately then pour wet into the dry while stirring with a fork. Add just enough liquid to absorb the flour mixture and handle dough without getting too sticky. Add liquid or more flour to get this consistency and do not over knead or you will end up with tough bannock. Press down flat onto a sheet or cast iron skillet and bake at 370° F (187° C), until top of bannock is golden brown. • In a large pot, bring the stock and some water to a boil. Add a bouillon cube (optional). There should be enough liquid to cover all of the ingredients you will be adding to your pot. • Add ribs and quartered onion to the liquid and continue at a medium boil. • Set timer for 20-30 mins for the ribs. • While you are waiting you can cut up the spuds, carrots and turnips into sizeable chunks. • When the timer sounds, add the root veggies to the pot and boil until they are cooked to your liking, testing them periodically with a fork. • The aim is to have the veggies cooked at the same time as the ribs so you really have to know the meat you’re working with. Ribs from a tough old moose will obviously have to boil longer before adding the root veggies. • When the pot ingredients are cooked to your liking, serve directly from the pot, having eaters load their plates to their liking with a long fork and slotted spoon. Serve with bannock and tea. • If you have day old bannock or tough bannock that turn out so well, don’t waste it. Break it into pieces and soak in the rib broth for a few minutes for some Cree-style shortcut dumplings. The bannock soaks up the rib grease and broth flavourings quite nicely.